The economic growth of any economy depends on how much is invested in creating productive assets in it. Factories, buildings, ports, the transportation network, natural resource extraction, manpower training, the use of modern methods of manufacturing, energy production and distribution networks — all require investment. Part of the investment arises from domestic savings, part from foreign borrowings, and part from foreign direct investment (FDI.) Let’s look at how India does in FDI compared to other countries. Here I will not address what kind of changes need to happen for India to attract, say, 10 times as much FDI as it currently does. That’s feasible but not with the current policies and leadership. Anyway, here are the facts. The following graphic is from howmuch.net. Note that the size of the images of the countries is in proportion to the FDI, and not their actual geographical size. Thus India (in “Mostly Unfree” red), which is vastly bigger than Singapore or Hong Kong (in “Free” green) in land mass, is shown much smaller than those two tiny regions. India received $34.4 billion in FDI. That’s a quarter of what China received, and a third of tiny Hong Kong’s FDI. Since Hong Kong is part of China, the FDI for China as a whole is nearly seven times India’s FDI. That’s shameful, to put it very generously. There is a vast gulf between the FDI that India receives — an economically repressed country — and what Singapore (an economically free state) receives, for example. Singapore gets $67.6 billion, nearly twice as much as India. But until you normalize the numbers by population, you don’t get the real picture. Singapore’s population is less than 6 million and India’s population is over 1,200 million — around 200 times that of Singapore. Therefore Singapore’s per capita FDI is 400 times that of India. Four hundred is a big multiplier. Imagine if you were paid $1 instead of $400. Or take Hong Kong with its population of a little over 7 million and $103 billion in FDI. In per capita terms, Hong Kong got 520 times as much FDI as India. For every dollar an Indian receives in FDI, Hong Kong residents receive $520. Five-hundred and twenty is an even bigger multiplier. Meaning, India receives on a per capita basis practically nothing compared to Hong Kong or Singapore. India’s performance is abysmally poor. Three cheers for Nehruvian socialism. India is not just poor, it has been impoverished. India’s poverty has been engineered. The surest method of impoverishing someone is to deny the person the freedom to be productive. In other words, enslavement guarantees poverty. Freedom is a necessary (although not sufficient) condition for prosperity. Comprehensive barriers to individual economic freedom translates into mass poverty on the aggregate. 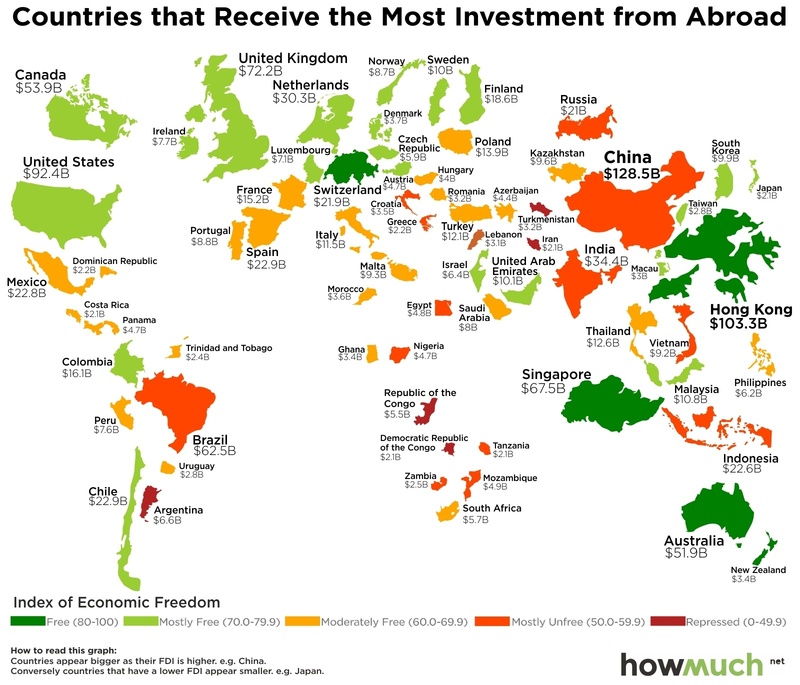 In the graphic above, India is listed as “mostly unfree.” Indians are not economically free. Why? The reason is historical. The British enslaved the Indian economy by putting in place an extractive and exploitative regime. The administrative and governmental institutions they created for that purpose was handed over intact to the Indian leaders who took over from the British when they left in 1947. India became independent but Indians never became economically free. Why? For the same reason that the British enjoyed ruling India. The system was designed to give enormous powers to the government and thus those in power enjoyed royal privileges. It is understandable, therefore, that when Gandhi and his protégé took control of India from the British, they figured that they had a good thing going and saw no reason to lose those privileges by granting economic freedom to Indians. This pattern of maintenance of this freedom-denying status quo has been seen in every subsequent transition of power. Different political parties and coalitions take over but Indians continue to lack freedom. Just note what happened in the latest transition in 2014. The BJP and its NDA partners came into power with overwhelming majority in parliament but they continued (and even doubled-down on) every major economic freedom-denying policy of the Antonia Maino UPA government. Mind you that I am not blaming the British for impoverishing India post-1947. They were the colonial masters and they did what was in their interest. The weak get ruled. That’s the law. What I find hard to countenance is how Indians continued to betray their own kind in their lust for power, wealth and control. So even after 70 years of independence, India languishes at the bottom of the heap. Although it is not a failed state, it is an economic basket case. But can one reasonably assign all the blame to Indian politicians and bureaucrats alone? Honestly no. Indians have a collective responsibility for what they suffer or enjoy. Actions have unavoidable consequences. The answer to why Indians are not economically free has to ultimately be because Indians don’t value freedom and therefore they don’t demand it. Perhaps Indians have a hard time imagining what economic freedom is, having never really tasted it. Sure they do have the freedom to vote. (And we are all aware of the great treasures they vote into office.) But political freedom is not worth a damn absent economic freedom. Not that we need to pull out the big guns to make the simple case that economic freedom trumps political freedom when it comes to material prosperity, let me do that just the same. Here’s a 91-year old Milton Friedman in conversation with Gary Becker back in 2003. You can have economic freedom without political freedom, provided you have a large measure of civic freedom. But you can have economic freedom without any political freedom at all. That’s been demonstrated by Hong Kong. Until the Chinese took over, Hong Kong had no political freedom at all. It was run by an emissary of the British government in London. … The emissaries they sent out believed in economic freedom as a way to make Hong Kong most productive. And they maintained complete economic freedom. In fact it is hard to find any country in the world that had as much economic freedom as Hong Kong did at that time. For example, no tariff protection at all, no restrictions on imports and exports. But it also maintained civic freedom. The citizens of Hong Kong were free to say what they wanted, to print what they wanted, to assemble, to meet. Singapore is another example. Lee Kuan Yew was fundamentally a dictator but a benevolent dictator and he too saw the merits of economic freedom —not as much economic freedom as Hong Kong though. Notice that Friedman mentions Hong Kong and Singapore — two economies that are in the top FDI list and in the economic freedom list. Freedom is of value in itself but it also has instrumental value. Freedom comes in three flavors: civic, economic and political. Economic freedom is necessary for prosperity. Economic freedom is also necessary because without it political freedom is meaningless. Indians are unaware that they do not have economic freedom. Indians have awaken to the reality of their predicament. About 20 percent of the population needs to demand economic freedom for the government to act to free all India. Gurudev Rabindranath Thakur wrote Gitanjali about a land of freedom into which he wanted his countrymen to awaken. We are far from there. A billion people have to freed to get there. And now for a shameless plug for a new initiative that we call “Free a Billion.” The idea is really very good, and certainly much better than the cheesy, hackneyed, unimaginative logo would lead you to believe. FAB—Free a Billion—is not one of those flag-waving jhanda uncha rahe hamara kind of deal. The main idea is to make people realize that they can—and must—get behind a struggle for real freedom, and not just be content with the fake freedom of socialism. Go take a look. I found your article peculiar. First of all,why do people invest,particularly in foreign countries. Sure its not out of charity and sure has to do with getting a decent return, the higher the rate the better. On what particular sectors did ‘foreigners’ invest in China? Obviously, until recently it has to do with cheap labour manufacture for export and Chinese labours are literate and hardworking so it worked and large amount of related FDI went to china. A smaller amount probably also went into real estate in big Chinese cities. But if one is talking about the core basic industry and nation building like the (truely gigantic)cement, steel, energy industry, housing for the masses, schools, high speed rail.. it has been over 99% invested by Chinese in China. YES, Yes, invested by the evil, freedom killing commie central planning commission. My conclusion is the main good FDI did for china is to provide employment to rural migrants and help urbanisations in coastal area. Any good example of a middle size(and up)country with population of 50 millions at least and little resource/commodities export potential that depended mainly on FDI to develope? 1)India missed the last big boat departure of using cheap labour manufacture for export to jump start 3rd world economy. I’m not saying India is not capable of making progress on manufacture; but to attract FDI on manufacture for export to create employment is too late. Indian workers will find themselves wage capped by robot maintenance cost in other countries. Increasingly ‘cheap’ products’ like shoes will be made by advanced robots. Any other indian sectors that would enable foreigners/overseas Indians to make good investment return in foreign money…,other than say real estate in bigger indian cities? 2)I remember you said “call me elitist if you want to”. I’m sure 10,000 English speaking indian employees working in air-conditioned ‘call centres’ projects a better image than say 100,000 cell phones assembly line workers in China. Hard to visualize that Kazakhstan’s economy is more or less at par with India. GDP terms. 2 tri vs 1.73 tri. Rating agencies rate this country much more stable than India. A country that western media does not much care to talk about. Sum total of FDI stock ww is about 16360 billion dollars. India’s share is about 2 %.and growing China at about 8 % and declining, US at 17% continues to the largest destination of foreign investment and its growing. Notwithstanding bad governance and high inflation, Brazil received around half the foreign investments that China did till date in terms of foreign investments it received till date. The Kingdom of Saudi Arabia (where there isn’t much of a law) has received almost the same foreign investments as India. A tad less than India but former is just a desert and everything is legally owned by the King.. local or foreign. Likes of Arun Jaitley, Raghuram Rajan and Narendra Modi should review the conditions that led to investments in other countries before claiming credit for ‘improved’ FDI into India.